Pixar theory: This grand unified theory explains how Monsters Inc.’s Boo grows up to be the elderly witch from Brave. Those Easter eggs aren’t inside jokes—they tell the secret history of a world where the little girl from Monsters Inc. grows up to be the elderly witch from Brave. 1. This is a world with magic. The witches have the power to cast spells that can turn humans into animals. Their powers can also be used to manipulate inanimate objects. 2. The witch, as witches tend to do, behaves oddly, disappearing behind doors and obsessing over wood. So, what happens to the animals that the witch experiments on? They repopulate and, thanks to evolution, slowly but surely become increasingly more human over the centuries that follow. The next movie in the universe’s timeline is The Incredibles, which is set in the 1950s and ’60s and falls nine or so centuries after Brave on the Pixar timeline. Here we meet a super breed of humans who are systematically wiped out over the course of two decades. What’s significant as far as the theory is concerned is the manner of their demise. Buddy (aka Syndrome), who lacks super powers himself, relies on super advanced technology in order to seek his revenge against Mr. Incredible and his family. This marks the beginning of the rise of the AI machines. The Omnidroid and Syndrome’s other advanced technologies have learned that force doesn’t work when trying to control humans. Instead, over the next few decades, the machines launch an industrial revolution, building a faceless corporation called Buy-N-Large that they use to dominate the consumer-obsessed humans. Next comes Toy Story, where we discover that toys have somehow become sentient and operate by rules to please humans. (We also learn that BNL builds the batteries that power Buzz Lightyear.) 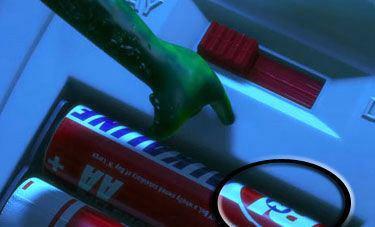 In Toy Story 2 we find out that Woody comes from a popular show in the ’50s, and that his toy line is discontinued—something Jessie and Stinky Pete were aware of but that Woody was not. Why? Because the AI machines used zero point energy to gradually induce life in all inanimate objects, including toys. Since BNL came into being after Woody’s Roundup, Woody would have no recollection of this. The next movie in the timeline is Ratatouille, taking place in 2007 Paris. Animals are beginning to experiment with human activities, such as cooking. This rebellion against their instincts shows us that the descendants of the humans-turned-animals from Brave have made it from Scotland to France, and likely beyond. The plot also highlights the growing animosity between animals and humans. This brings us to the next movie in the timeline, Finding Nemo, which takes place roughly around the same time as Toy Story 3. We know this because Molly (Andy’s sister) is reading a magazine with Darla on the cover. This is the same Darla from Finding Nemo, and she hasn’t aged. Finding Nemo continues to explore the animosity between animals and humans, but also shows us the result of growing intelligence among animals. Sharks are trying to be vegetarians, fish are helping each other across an entire ocean network, and animals are trying to get out of their tanks and cages. Before this all comes to a head, we have to acknowledge Toy Story 3, which takes place in 2010. This movie really delivers the point that toys will do anything for their owners, even if that means losing their purpose and happiness. This bond between objects and humans sets the tone for what’s about to happen next. 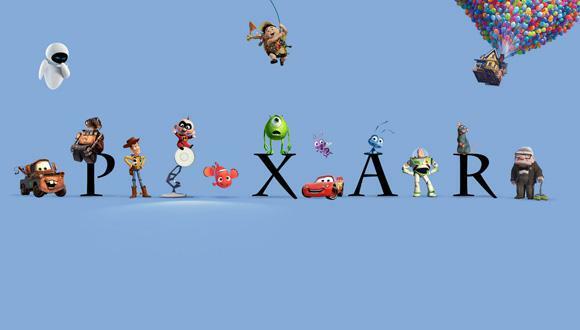 The next movie in the timeline is Up, which takes place years after Toy Story 3. 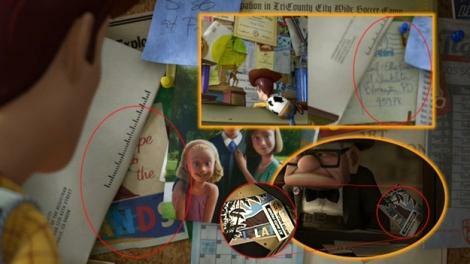 We know this because there’s a postcard from Carl and Ellie in Andy’s room. This means that Ellie is still alive and the events of Up have not yet happened. Up is extremely important because we finally see BNL taking over. Carl is forced out of his house by a corporation that is trying to expand the city. Even more importantly, we find Charles Muntz has invented collars that allow him to hear the thoughts of his dogs. It’s likely that the events of Ratatouille happened in plenty of other places, giving Muntz the idea that his ambitions could be accomplished more efficiently by animals, since he’s tracking a bird. The implication of this technology is that humans are beginning to overstep their bounds with animals, causing an imbalance of nature. We don’t know exactly what happens between humans and animals, but we do know that machines take over completely. In Wall-E, which takes place centuries later, we learn that BNL takes over all of the world governments and exiles humans to space so that they can “clean up” the mess they’ve made from pollution. We don’t see what the planet looks like before humans leave, which means BNL could have exiled humans in an effort to curb the intelligence and growing dominance of animals. The next movie in the timeline is Cars, which explores a familiar Earth being populated by machines with human qualities. Strangely, very few animals exist because of this. The problem with machines running Earth, however, is that the planet is drained of resources, a problem addressed in Cars 2. BNL realizes that Earth is useless because of this and abandons the planet entirely. The result is a barren wasteland, 700 years later. In Wall-E, we find a robot that BNL left behind that is still trying to fulfill his programming. 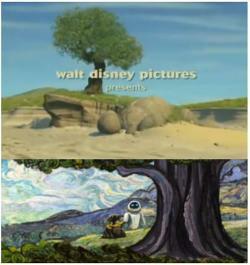 Wall-E likely survived because of his ingenuity. He scavenges parts to stay running, befriends a cockroach, and watches old movies. For the same reason that toys seem to stay “alive” because of the love of humans, so does Wall-E. He discovers the last shred of life on Earth and travels to Axiom to be with Eve. The problem is that Axiom is run by the AutoPilot (an A.I. of course) and tries to stop Wall-E from freeing humans from their dependence on machines. Wall-E liberates the humans and they rebuild society on Earth. In the credits, we see the last plant-life has grown into a mighty tree. We next see that tree on the island in A Bug’s Life, where we find that animals are living separately from humans—something we never see in the other Pixar films—incorporating human activities such as cities and a circus in their lifestyle. Because the Earth was terribly polluted, animals have begin mutating as a result of adaptation. They have progressed past humans and overshadow their limited population. As a result, humans die out and animals become the dominant species. After thousands of years, animals become “monsters,” the super-species we see in Monsters University and Monsters Inc. The only problem is that humans are the source of energy for machines, so the monsters have an energy crisis without them. So the monsters invent time-traveling doors that allow them to harvest energy from humans in the past. To prevent monsters from changing time, they are taught to believe humans are toxic and they can’t alter that world. Only a few monsters at the top know that this is time travel. As a result, Sully becomes attached to a human child named Mary (Boo) who grows to love him. When Sully eventually disappears, Boo becomes obsessed with trying to find him. Because of her time in the monster world, she knows that doors are the key. So Boo finds a way to use wood as a means of time travel, using doors. She becomes a witch, traveling across time to find Sully, not realizing that he was millennia ahead of her. So Boo goes backward, believing that finding the source of this magic will make her powerful enough to find him. She is the witch from Brave. Her love for Sully is actually the crux of the Pixar universe. 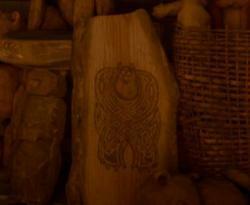 The proof: This carving, just glimpsed in the witch’s cabin.